In the Qualtrics main screen, select “Results” for the project you would like to export. Select the “Download Data” icon – the one that looks like a vintage computer disk. To download your data, select the “CSV” format, which is the first option listed. If your data set includes multiple choice and/or Likert scales, select “Show answers as choice text”. This will show text responses in MAXQDA rather than numbers (e.g. ‘strongly agree’ vs. ‘5’). Showing answers as choice text will make it much easier to work with these variables in MAXQDA, specifically if you use the variables for activation of document sets, and if you want to use MAXQDA’s built-in quantitative chart-making tool. Open up your new CSV file. This file will open in Excel, and it will look like an Excel file. But it’s not. Since MAXQDA cannot import CSV files, you need to save it as an Excel file first. Make sure to change “Unicode Text” to “Excel Workbook”. Delete the CSV file from your computer, or archive it in your project folder. Make sure you’ve opened your new Excel file that you just created. First, you will have to delete row number 1, which contains question numbers. You have to take this column out – and not just delete the content – because MAXQDA uses the top row of your Excel table to name cases, document groups, variables and code names. Take out cases that are empty. In our example, the data set contains a series of results from viewing and testing the survey. We don’t want those in our survey, so we delete these rows. Save your Excel sheet and close it! Response ID: These are very handy as de-identified case names later on. Keep them! Response Set: You can later use the Response Set as a document group name if you have several response sets (i.e. from having different collectors in Qualitrics for different research locations or times). Keep that column. Equal Symbols/Dashes: Always conduct a lexical search for equal symbols (=) and dashes (-) and replace them with an asterisk symbol (*), using Excel’s search & replace function. Sometimes participants use equation symbols and dashes to mimic bullet points or arrows in surveys. Excel will think that this data entry is a formula, and produce an error message (“#NAME?”). Thus, fields that start with equal symbols or dashes will show no data in MAXQDA. Character Limits on Questions: If possible, shorten your questions before you import data. MAXQDA will cut off code names and variable names after 62 characters. If you intend to import data from different Excel sheets, you will need to make sure that the names in the column headers are exactly identical. Otherwise MAXQDA will create new codes and variables, and you’ll have to spend some time merging things in MAXQDA. Create and open a new project file in MAXQDA. Select your Excel spreadsheet & import. In the import dialogue screen you specify which data will be imported, and how it will be imported. Checking the “Code” box will import data as codeable text, and it will automatically code that data with the name of the question. Choose this option for textual data, such as short answers & essay boxes. 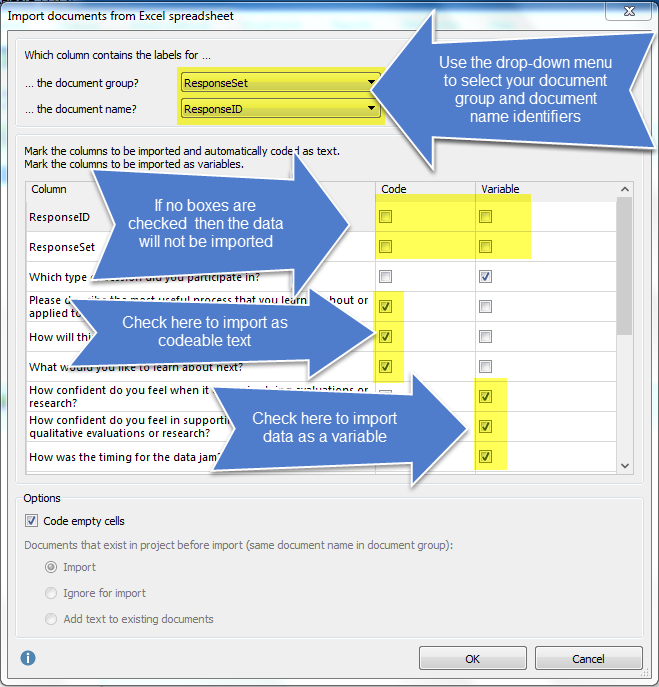 Checking the “Variable” box will import data as a variable. Choose this option for numbers, Likert scales and other pre-structured data. Checking no checkbox will not import a specific piece of data. Checking both will import it as both codable field and variable. Choosing your Document Group. Using the ResponseSet for naming the document group is convenient. However, you can use any variable in your data to create the sets (e.g. participants’ profession). If you choose a variable to distinguish document groups, you should still import this variable ALSO as a variable below. Choosing your Document Name. Qualtrics provides you with random response IDs, so it makes sense for most projects to use them as document names. “Code empty cells.” If you check this option, empty answer fields will be coded. When you later run a coding query, you will retrieve a coded segment for each of your imported cases; if one of the participants did not type in any answer, this coded segment will be blank. That way you’ll know that this participant did not answer your question, and you can even code it as ‘no response’. If you do not check this option, a blank answer field will simply be skipped. That, on the other hand, has the advantage that you can see with one glimpse in your document browser which participants skipped questions – because the number of coded segments corresponds with the number of answered questions in the data set. MAXQDA doesn’t do stats. It’s a common mistake to import all quantitative/structured data into a MAXQDA project file. In many cases, it is advisable to import additional data derived from statistical analyses later on, rather than filling MAXQDA with raw statistical data that you will not use in the software. Import is trial and error. Import your data. Then look at the data set and evaluate. Am I missing certain data? Should I have imported a certain piece of data as a codable field instead? Did I import clutter? Plan for 2-4 hours to create your dataset. Don’t rush it, and don’t expect that it will be perfect the first time around. After your first import, go through some analytic workflows that you will employ, and assess if you’ve got the right data, and if the data is represented in the right way. Be prepared to repeat the import a couple of times. Take notes of the things you tweaked, so that the next round of data import is consistent, and less arduous. At this point, it is always helpful to have an experienced MAXQDA user look over your project. If you have imported all your data: Creating a new top-level code called “Survey Structure”, and dragging the question codes into that code is a good way to tidy up the project file. Assigning a code color to all the question codes is also helpful; that way you can ‘hide’ the question codes later in the document browser by un-checking certain colors from being displayed. If you’re intending to import more data later: Avoid renaming any of the question-codes, and do not nest them in other codes. MAXQDA will look for existing codes and variables when you import the next batch of data. The names of variables and codes need to match exactly, and codes do have to be in the top-level of the code tree hierarchy to be detected. That’s also important to remember if you shortened your questions in Excel prior to import (see Phase 3). If you have shortened your column headers in Excel: Create code memos at the newly created question-codes, and paste the original questions into the memo. Additionally, add a list of your questions that yielded the variable data. You can use a memo for that, but we found it to be useful to put this kind of information into a new MAXQDA document within the project file.